Okay, so you know how I'm currently obsessed with my Wishing Stars after I made nearly 3 dozen of them to fill a jar to photograph for the front of my business cards. Well, my mom was over the other day and said that she'd like a pair of earrings made out of a pair of them. Yes! Earrings! Cool! I grabbed my yarn and hook and got busy crocheting. **Did that make anyone think of Shawshank Redemption too? Makes me want to say it again, but this time imagine Tim Robbins saying it, okay? I made a pair of Wishing Stars out of size 10 metallic gold crochet thread, using a size 8 steel crochet hook. 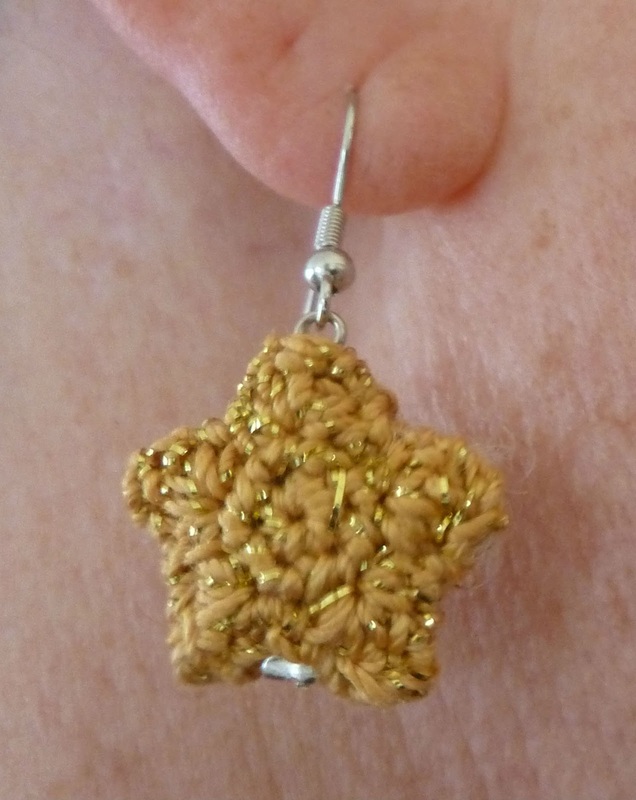 Actually, that means I crocheted 4 star pieces, and then sewed them together to make 2 stars. Then I assembled my jewelry making supplies and turned them into earrings. 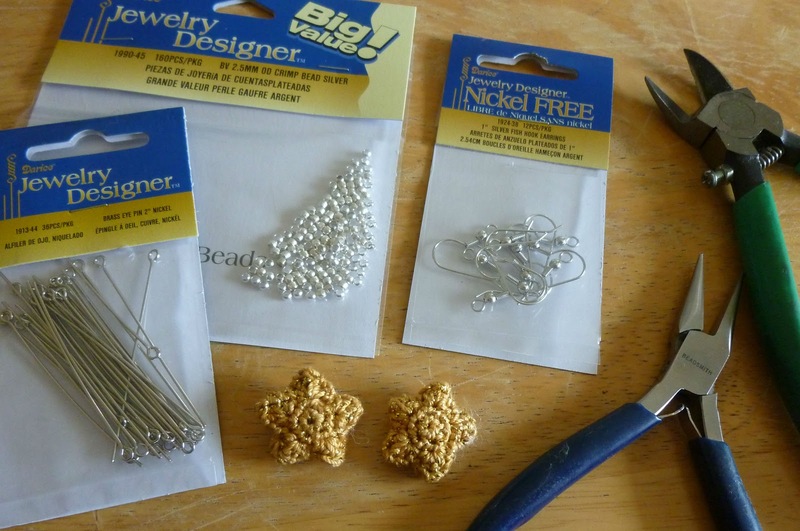 If you are an experienced jewelry designer, this will not be the tutorial for you. But! if you've always wanted to make cute handcrafted earrings, but you could never get the wires to curl right, then welcome to the easiest way to make earrings ever! I refuse to call this a cheater way, or a down-and-dirty way to make earrings, since I totally found this way of making earrings from a pricey pair I picked up in Nordstrom a couple of years ago. I noticed that there was a crimp bead at the base of the earring, holding the beads on an eye pin. Genius! 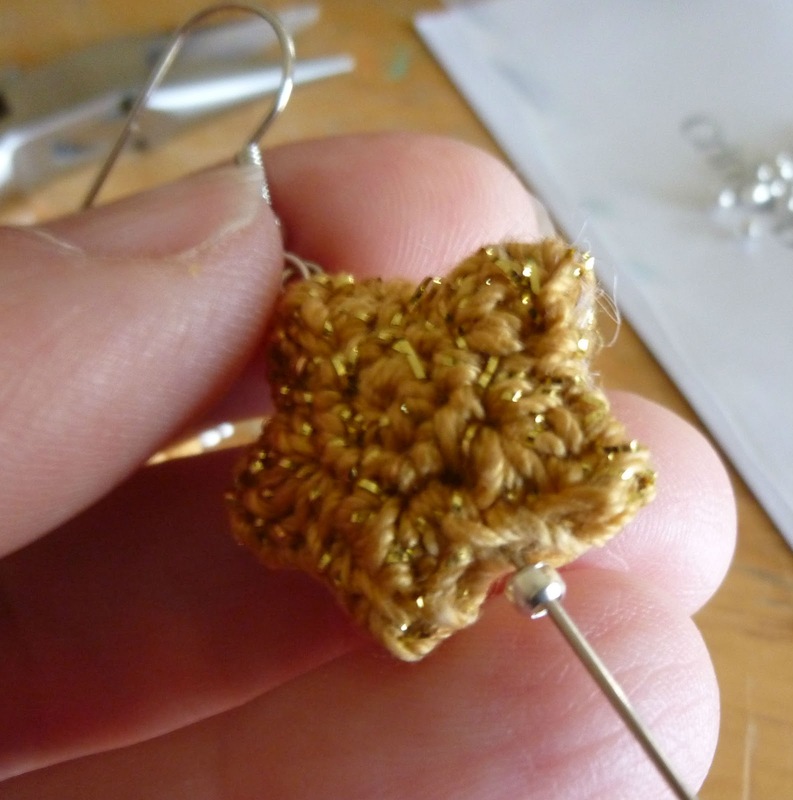 So, of course, that's been my preferred way of making earrings ever since. And that's what I'm going to show you how to do today. Open the lower ring of the ear wire and put the eye pin on. Close the ear wire ring back up. It's okay if the eye pin isn't completely closed tightly. The way it comes in the package, it won't slide off. Slide the wishing star onto the eye pin. Make sure you like how it's centered on the pin. Slide the crimp bead on after the star. 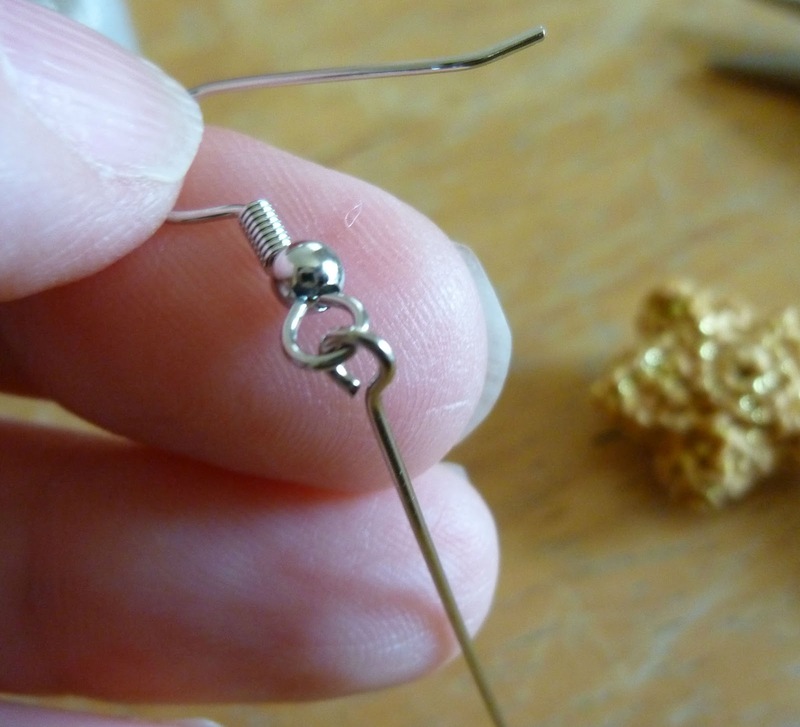 Use your wire cutters to snip the long end of the eye pin off right below the crimp bead. If the edge is super sharp and pokey, you can use an emery board to file the edge just a little. 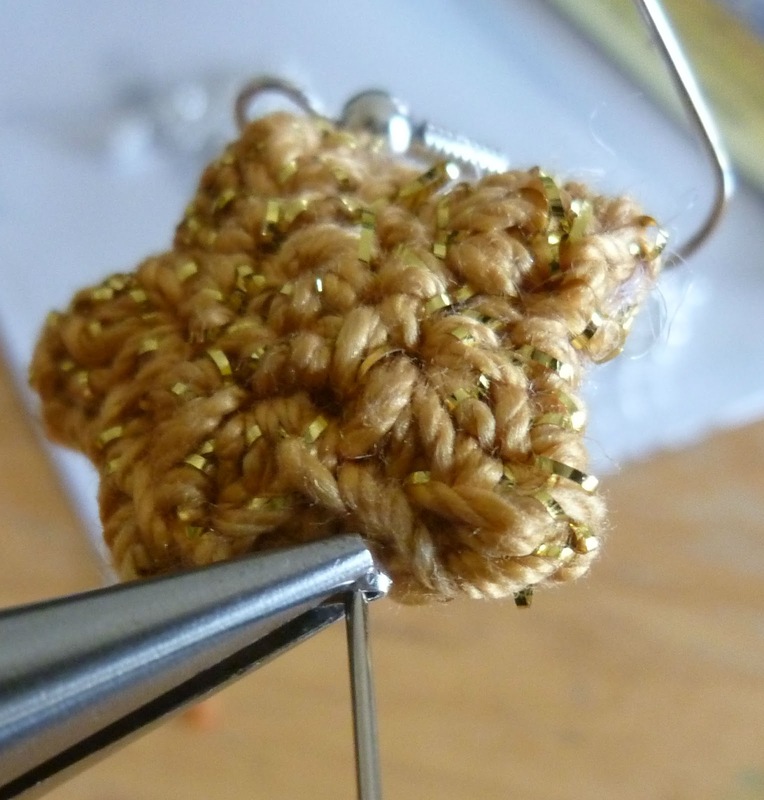 You don't have to just use the tiny tiny thread on these. 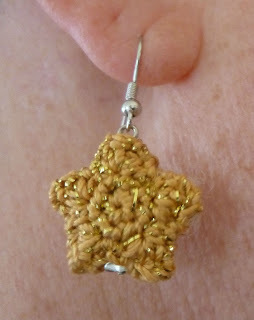 I used some Vanna's Glamour by Lion Brand in Platinum, with a size D hook, and made some awesome silver earrings. I need to remember to ask you about these at the next crochet club -- I've been back-of-my-mind thinking about making crocheted earrings, but the ones my friend made with fish hook style earring-pieces seemed to not hang right..... (it's something I can't explain in writing, must be seen). But yours look great, so I don't know what the problem was... hmmm. 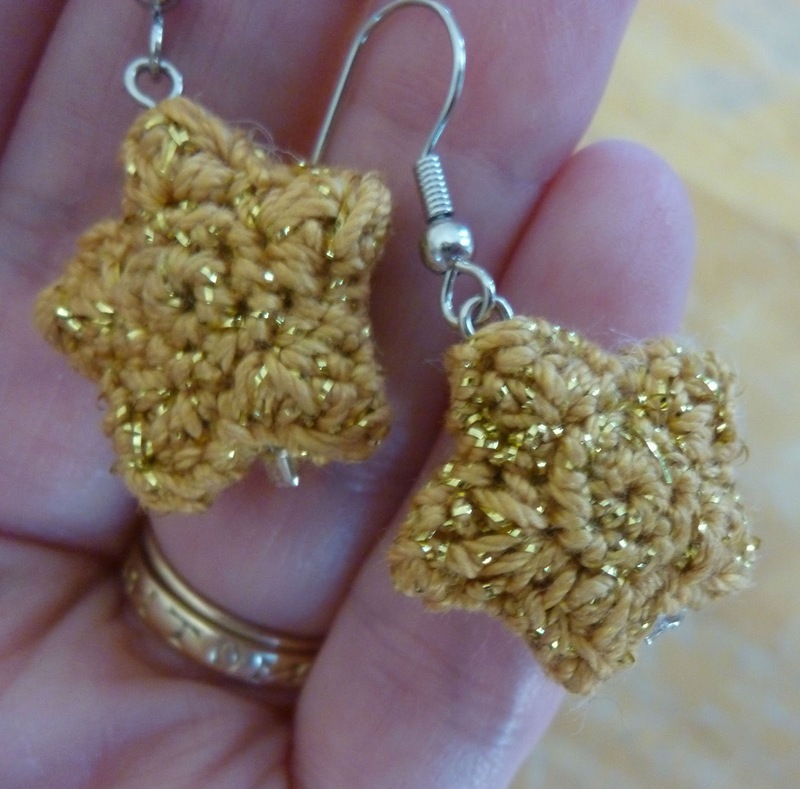 If you want to make a pair of stars to bring to crochet club you can turn them into earrings here! I don't know if you could tell from the picture, but I got the jewelry making supplies in bulk! LOL!!! 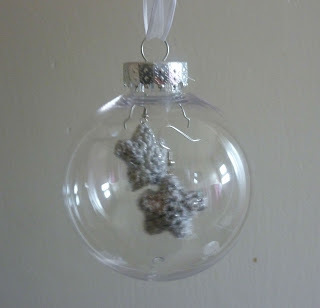 In fact, it would work with any tiny crocheted sphere/bead/two-sided motif, if you'd like to make something different. No worries if you're too busy! Bring the ones your friend made if you want, or I'll just show you what I've got in person. Hi Susan! I'm glad you found me! My parents and my sister are teachers too. My mom made some to use as finger puppets to help her students with letter recognition. She's using velcro and a laminated alphabet with them. You are very welcome, Mom! Thanks for the good idea! They came out very lovely and quite elegant, and I love the Christmas bulb idea, you could sell those for sure.. LOL @ the shawshank redemption comment, lol. In fact, Jake has suggested we cafepress a 'Get Busy Crocheting or Get Busy Dying' t-shirt... Ahahahaha! new follower here! and I love the earrings. Hi Brenda! Thank you so much!! Your blog is charming and you've got a new follower too!!! I'd like your suggestions for jewelry findings for those of us who don't have their ears pierced. I've had little luck finding items without nickel, which I require. My other thought is that you could try a trick that I used to use in my cheap earring days, and paint the surfaces that were going to be touching your ears with clear nail polish. I used to do that with the earring studs and it worked great, as long as I didn't wear the coating off. Of course, my sensitivity might be different from yours, but if you can't find anything else, that might be a short term solution. Jamie,Thank you so much for all your wonderful crochet patterns. I especially love these earrings! As I was saving the pattern, I happened to think that you could make an earring & necklace set. Just make one star & put it together like you did with the eye pin & crimp bead but without the fish hook earring. Just attach the eye pin onto a chain necklace. I love jewelry sets & your stars would make a nice one! So glad I came across this post! 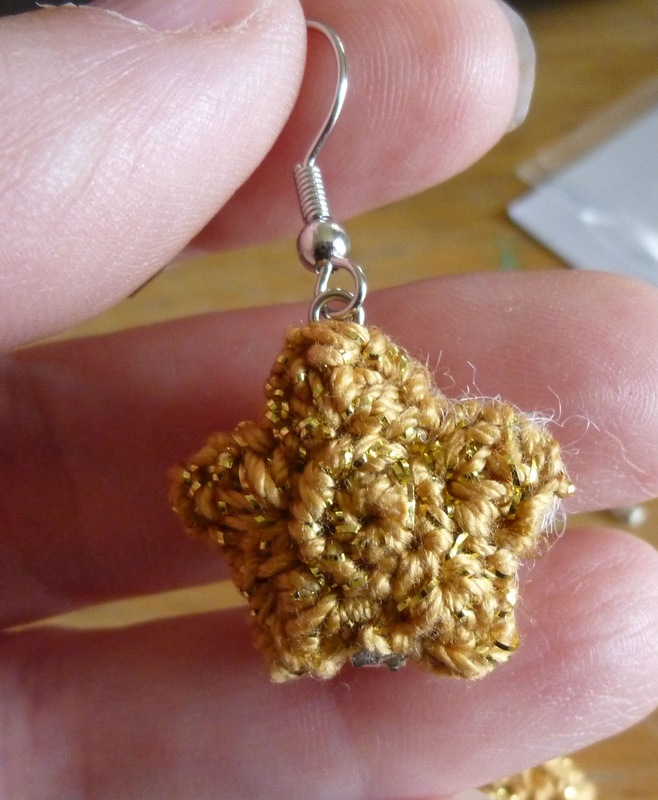 I have been stuck on what to make my friend for her birthday in June (because how do you top a crocheted blanket haha) anyways she loves funky and fun earrings so this will be perfect ... Thanks!! Better go get cracking since I'm still working on 2013 Christmas presents =p Thanks again! !